Mixed In Key has just released Odesi, a new type of software that’s designed to speed up music production in Ableton Live, Logic, Reason, Pro Tools and all other music production software. 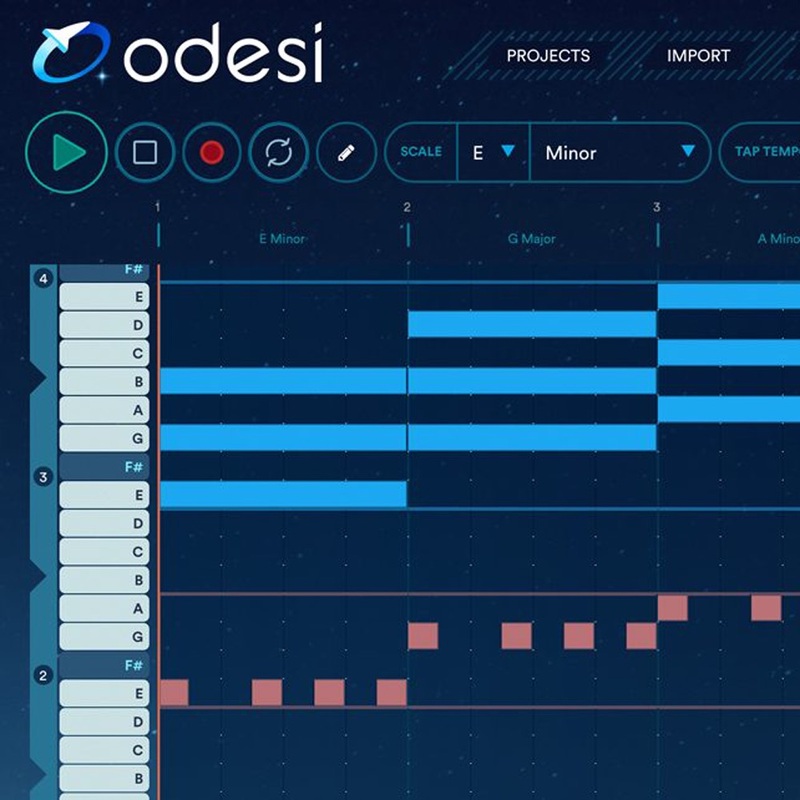 Odesi helps producers, vocalists, song-writers and DJs create melodies, basslines and chord progressions, as well as memorable hooks. Check out the introduction video to get an idea of what Odesi can do for you. The well thought out layout of the software makes it easy to get to grips with whats happening almost immediately resulting in quick results, seamless workflow and tonnes of fun from the start! Odesi looks like the MIDI view found in most DAW's meaning nearly every producer should feel at home when using it. What separates Odesi is the fact you can view each element you are working on (Drums, bass, lead synth) in one screen together. Odesi supports MIDI export Ableton Live, Reason, Pro Tools, Logic and all other DAWs meaning you can easily transfer the work you have created within the software instantly into a different project. This software is a go to for anyone experiencing writers block. Set up the foundations for a track quickly and easily by selecting a drum pattern and choosing from one of 138 different chord progressions, apply the bassline generator and now you have a fresh foundation to start building on top of. The same process applies to any new producer getting swamped down a bummed out with seemingly endless theory! By using Odesi to augment your process you can learn at the same time as working on new music keeping you excited and switched on to whats happening with your latest track. Sonic sketchpad: Odesi is an ultra-fast MIDI editor that makes it possible to sketch musical ideas and save them to a session that can be opened in any other DAW to choose the sounds and finish the productionAutomatic “Snap-to-Key and Scale”: The default view shows which notes are allowed in a specific Key and Scale, making it impossible to go off-key in the compositionChord Progressions: Odesi makes it easy to write custom chord progressions, or use a bank of 138 memorable progressions used in today’s popular music, with deep customization optionsRhythms: The musician can apply rhythms to both Chords and Basslines, creating endless combinations of intertwined rhythms. There is a bank of 138 highly-customizable ideas, discovered by Mixed In Key, in Pop music, Hip Hop, Rock, Caribbean and Latin music, as well as the most popular rhythms found in electronic music tracks produced from 1986 to today – starting with early Chicago House and ending with the latest Beatport top 100Intelligent basslines: When the project contains a Chord Progression, the Bassline generator will adjust to match the chords, making it easy to experiment with different basslines without having to edit the MIDI notes with every chord changeNew visualization of MIDI: Odesi displays all notes on a single canvas. Chords, Melody, Bass and Drums are visible on the same screen, enabling edits to be made faster and more easilyAcceleration of Ableton Live, Logic and other DAWs: Odesi supports MIDI export to Ableton Live, Reason, Pro Tools, Logic and all other DAWsAccess your sessions from anywhere: Odesi runs in a web browser, and is accessible anywhere, anytime. Older sessions will no longer be lost on external hard drives and buried in a closet. When a session is finished, Odesi automatically sends it as an email attachment for backup and safekeeping.Recording on the road: Odesi allows you to record melodies, chords and bass from both your MIDI controller and your computer keyboard. If you’re on a Macbook and don’t have a controller available, you can use the 1, 2, 3, 4, 5, 6, 7, 8, 9 keys to play the beats, and ASDFGHJ keys to play notes.Sound banks pulled from today’s hottest music: Although the “grand piano” sound can be used in the web version, there is also a companion app for Mac OS X that extends Odesi with support for 117 different sounds, pulled from today’s hottest music. It contains pianos, leads basses and drum kits that sound crisp and “current.” The musician can put together an audio demo of the track without leaving Odesi when running Mac OS X 10.10 or newer.Change Key and Scale anytime: Odesi can change the Key and Scale of the entire composition, even after the entire MIDI was already written. It’s possible to change the mood from Major to Minor, or to add a Blues feeling to the track. It makes it easier to adjust the composition to fit a vocalist’s range as well and experiment with different keys. Odesi was created by Mixed In Key, the award-winning software company known for its harmonic mixing and DJ products. Other products include Mixed In Key for harmonic mixing, Platinum Notes for audio quality improvement of MP3 and WAV files, Flow 8 Deck for live DJ performance with 2, 4 or 8 decks, Mashup for remix and mashup creation, and Beyond Beatmatching, a book written to empower DJs to play great shows. If you would like to learn from scratch or improve on already existing skills enrol on a DJ course now and learn to DJ with specialist one-to-one tuition! All our graduates get the chance to play several gigs all around London and beyond, this year we have even organised a week long of Ibiza with several students playing in all the top clubs including Sankeys and Amnesia, alongside boat parties with Pukka Up, pool & beach parties as well as rocking our regular slots in Egg, Ministry of Sound, McQueen, Lightbox and MORE! To get involved simply head over to our contact page or send us an email to: hello@londonsoundacademy.com.